(Nanowerk News) Light-emitting diodes (LEDs) are the modern lighting devices used in lamps, signals, signs or displays. By contrast, organic semiconducting light-emitting materials (OLEDs) can be incorporated in thin layers and used on curved surfaces. However, OLEDs for large-area illumination are cost-intensive at present owing to their low efficiency and short lifetime. One promising alternative for modern lighting is electroluminescence. Special nanoparticles, so-called phosphors, are excited in an electric field to emit light. 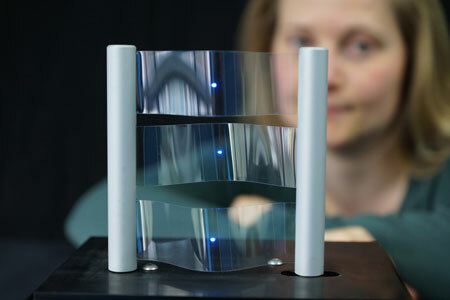 Researchers at the INM – Leibniz Institute for New Materials have now developed a new method that enables electroluminescence on large, curved surfaces in a cost-effective way: in this case, the light-emitting layer and all other components are produced by means of wet-chemical, printable methods. From 28 to 30 January, the researchers from the INM will present this result and further results in the German Pavilion at nano tech 2015 in Tokyo, Japan. “For processing we only need temperatures below 200 degrees Celsius. This means that we can apply all the required partial layers even to films or other flexible substrates,” explains Peter William de Oliveira, head of the program division Optical Materials. Hence, “luminous surfaces” could be produced very cost-effectively and even in large formats. The electroluminescent light sheets developed at the INM can be directly connected to the customary mains voltage of 230 volts. Rectifiers, ballast capacitors or other switching units that first adapt the voltage can be omitted. The researchers are currently working on further functionalization of the phosphor nanoparticles. “Our goal is to generate white light by means of an altered doping or by introducing coloured pigments into the luminous layer,” says physicist de Oliveira. At the same time the developers want to alter the materials in such a way that the light sheets can be used even at a lower mains voltage. From 28 to 30 January, the researchers from the INM will present this result and further results at the German Pavilion, Booth 5J-21. In the German Pavilion the Association of German Engineers (VDI) will pool the competences of all the German exhibitors. The German Pavilion is sponsored by the German Federal Ministry for the Economy and Energy. Furthermore the INM will demonstrate its competences in the course of the German day with the paper “Materials and Processing for functionalized Surfaces”. It will take place on 29 January in the Main Theatre in hall five.